Ireland's HICP and domestic CPI both point to well contained inflation. At the same time, there is evidence that pressures in Ireland are rising. Does Ireland have the kind of inflation that can be ignored and will return to path or is inflation there getting ready to be unruly? These are the kinds of questions that give central bankers sleepless nights. Just yesterday ECB head Mario Draghi spoke much more like he was willing to take the next step to go back to conducting even more stimulus after the bank's last move to announce it had gotten off the tightening path with a plan to do more LTRO loans beginning in September. Mr. Draghi now sounds like he thinks September is too far off to wait for and so he is open to trying something sooner if conditions warrant. Similarly the Fed in the U.S. released its minutes yesterday and in those minutes the Fed's decision-making body, the FOMC, sounded very much at odds with itself over what to do and how to think about policy despite the fact that a majority of members did not expect a rate hike in 2019 anymore. The real question is not what are central bankers going to do, but what are the real risks? What is inflation going to do? How much of the price pressure is just rising oil prices that will come and go and how much of that is a real lasting pressure that will alter the pace of ongoing inflation or accelerate it? In 2015 at a Kansas City Fed symposium at Jackson Hole Wyoming, a paper was presented arguing that none of the major models that purport to explain inflation works very well on consistent bases. They each have their moments of seeming to work. But none do so consistently. Maybe now someone is willing to believe that. Generally, we think of inflation as being the product of too much money growth, but there is also a competing theory of Keynesianism that argues that intensified bottleneck conditions will boost inflation. While Milton Friedman has argued that inflation is always and everywhere a monetary phenomenon—what is this? These modern economies apparently have little slack and labor markets are tight. In the Irish case, unemployment at 5.6% is back to its pre-Great Recession level. In the EMU, the unemployment rate was only briefly lower in 2007-2008. Policymakers everywhere have been on edge since the conditions for inflation to rise have been percolated by low unemployment rates... but inflation refuses to brew. But it will eventually...won't it? Ireland is a relatively small country. Of the 19 EMU members, it ranks as the eight smallest in population and eighth by land area and the ninth largest by GDP. Ireland's economy is only about 10% the size of Germany, EMU's largest economy and only about 3.5% the size of the four largest EMU economies (Germany, France, Italy, and Spain). Cleary, the macroeconomic environment of the EMU is not going to be affected much by Ireland per se when policy decisions are made. That is simply a cold, hard fact of the numbers. But Ireland, its central bank and its government will try to do what they can do as member is a customs union called the EU and an a monetary union called the EMU to remain compliant with the standards of the region. In the EMU, there are no national-level constraints on inflation. The communitywide objective is for the community gauge only. But clearly, countries that become persistently noncompliant seem to pay the price for it. 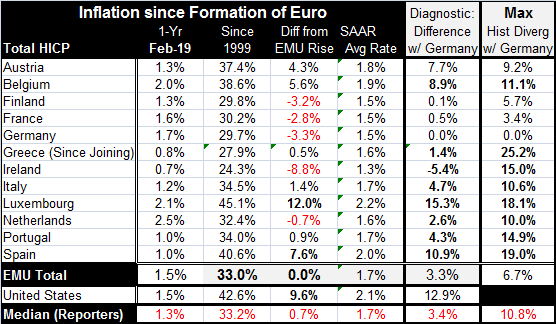 If we look at the listing of EMU's eldest members, we see that Greece, Luxembourg, Spain, Ireland, Portugal, Belgium and Italy have had large divergences from their original price ratio with Germany of more than 10% at one time or another. This list is also a good list of countries that have had problems in the euro area for one reason or another. Luxembourg is the clear exception on this list, but it is also a very small country and one that is a financial center making its ongoing ‘price competiveness' much less of an issue than for other members. Ireland is the only country that has its current price index as a ratio to Germanys below where it was when it joined the EMU although France, Finland and the Netherlands are also close. Current diagnostics find the maximum price divergence with Germany at 15% for Luxembourg, 10.9% for Spain, with all other members within 10% of their original ratio. Five countries have ratios with the EMU price level that are below what ratio was when they joined the EMU. In the course of the recovery from the Greet Recession, a number of countries had to undergo austerity measures and now they are more in line with their earlier price ratios to Germany, the largest EMU economy. Price levels and inflation rates are more tightly clustered in the EMU. Statistically, the divergence among core inflation rates for this group of members is near its historic low. The problem in the EMU has become much less one of excess inflation and much more a problem of weak growth with insufficient inflation. 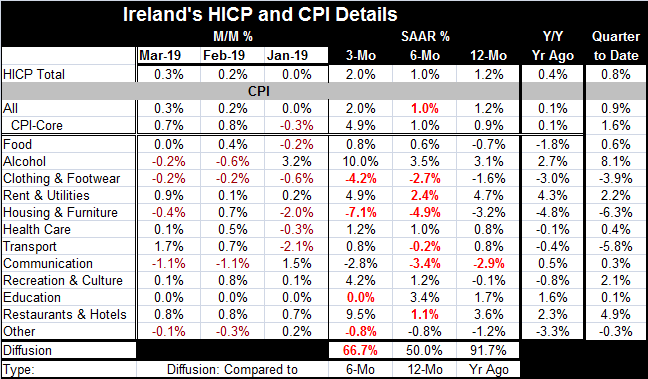 We see Ireland as an example with its year-on-year HICP inflation rate of 1.2% (domestic CPI at 1.2%) and with its HICP pace of 0.4% for the previous 12 months. Annualized inflation rates over 12 months (1.2%), to six months (1.0%), to three months (2.0%) are without clear trend. The domestic CPI shows core pressure rising over three months to a pace of 4.9% form 1% over six months and 0.9% over 12 months. And that is becoming broad-based as inflation is accelerating in only 66.7% of the sectors (see ‘diffusion' at the bottom of the three-month column). Year-on-year inflation diffusion shows rising pressure with a diffusion reading of 91.7. That implies that inflation over the past year is higher than it was in 9 out of 10 of the categories in the previous 12-month period. Headline the HICP inflation rose by 0.4% 12-months ago compared to 1.2% currently. There has been acceleration. Still, inflation overall in the quarter-to-date period is only rising at an annualized rate of 0.8%. Inflation has stepped and is somewhat broader, but it is still contained in the quarter. Inflation: real risk or just perceived? Inflation trends are tricky and inflation is a pernicious force that can undermine growth and interrupt economic expansions. Monetary policy is right to be vigilant about inflation. But many economists and central bankers ‘came of age' during a period when central bankers allowed inflation to gain pace. Apart from that shared Post War experience, there had also been experiences with hyperinflation. High inflation continues to be more of a characteristic in Latin America. But if we look at history, there have been some very long periods with price stability. Central bankers should ask themselves if they are seeing a bogeyman behind every tree because of their own ‘childhood' experiences and encounters in their own ‘formative years' or is there really inflation lurking behind every tree? New World Order; New Local Issues? Two facts central bankers seem to give short shrift to (1) globalization and (2) technology. It is well beyond the scope of this comment to go very far down the road to develop these themes fully. But clearly, global competitiveness and the expansion of international trade at a time that a very large less developed low wage country was being absorbed into the global trading system were important factors. The presence of such a force, such a large country that attracted so much investment and one that has been content to keep wages low as it has developed, has had a remarkable impact on global trading and pricing policies. Technology has been both cost-saving and labor-saving, but it also has been inflation compressing. Technology has given consumers astounding market power to seek out the best prices and have price information at their finger-tips that causes firms to have to compete harder and to accept lower margins. The dislocation of workers, jobs and incomes has given consumers another reason to bargain hard over each dollar spent. In short, this has been a perfect storm of price discipline that has brewed. It has made the economy in the new millennium stand a good distance apart from the creaky patched together thing that the global economy was in the Post War period no matter how fondly we look back at it.